Ivan Cleveland Rand was born in Moncton, New Brunswick, on April 27, 1884. He was the son of Nelson Rand and Minnie Turner. He worked five years for the Intercolonial Railway before attending Mount Allison University, from which he obtained a B.A. in 1909. Three years later, he earned an LL.B. from Harvard Law School. He was called to the bar of New Brunswick in 1912 but decided to move to Medicine Hat, Alberta, where he practised law for seven years. In 1920 he moved back to Moncton and later became counsel for the Canadian National Railways. He was named Attorney General of New Brunswick in 1924 and was a member of the Legislative Assembly from February to June 1925. On April 22, 1943, he was appointed to the Supreme Court of Canada. Two years later, he developed what is known as the "Rand formula," a mechanism for levying union dues, while acting as arbitrator in a Ford labour dispute. In 1947 he was also a member of the United Nations Special Committee on Palestine. 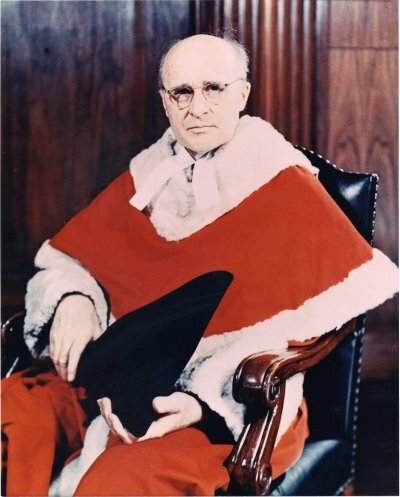 He served on the Supreme Court for 16 years and retired on April 27, 1959. Justice Rand died on January 2, 1969, at the age of 84.